Torune Aburame is a member of Aburame Clan and one of the highly ranked member of Root which was created by Danzo Shimura. After Torune’s father died when he was young, he was adopted by Shino Aburam’s family. Shino and Torune shares brother-like relationship. During the Five Kage Summit, Torune along with Fu Yamanaka escorted Danzo. Torune and Fu was captured by Tobi (Masked Man) during the Kage Summit and was used as sacrificial when Kabuto demonstrate the Summoning of Impure World Reincarnation. Let’s take a look at Torune Aburame’s abilities. Ninjutsu Extreme Secret Jutsu – Poisonous Dust Jutsu: Cause damage up to 9 units form the opponent’s team and Poisoning. Absorb 10 Chakra points from each hit target. Taijutsu, Ninjutsu Beetle Sphere: Attacks the opponent’s front row and absorb up to 20 Chakra points, also had a chance of 3 COMBO Repulse. Taijutsu, Ninjutsu Phosphorus Destruction Insect: Chases and Attacks a Repulsed unit, causes Low Float and Poisoning. Ninjutsu Poisonous Insects Clone: At the beginning of the battle, summon 1 insect clone with 100% Life of the original unit. With a Phosphorus Destruction Insect body skill, it can use a Beetle Sphere for a Standard Attack. Ninjutsu Phosphorus Destruction Insect Body: The unit causing Taijutsu damage to this unit may receive Poisoning effect. You can get Torune Aburame from the Kage Treasure and you can also get Torune’s fragments from the Survival Trial. 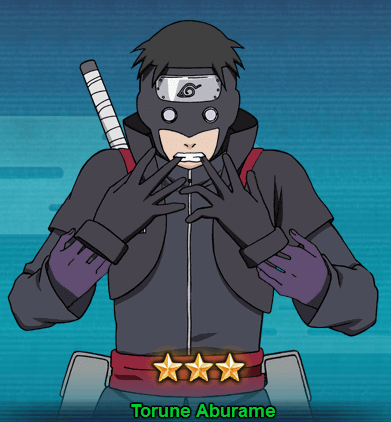 You need to draw 10 seal scrolls from Kage Treasure to get Torune Aburame.